Want to see how your Karaf container is performing? Try the ktop command. I've been working on a utility command for Apache Karaf based containers that will display JVM usage metrics in a manner similar to the Linux Top command. The result has been the Aetos ktop command. Aetos is Savoir Technologies' Integration Platform - essentially a custom stack of raw Apache projects that makes using Apache Karaf easy for developing and running production large scale enterprise solutions. 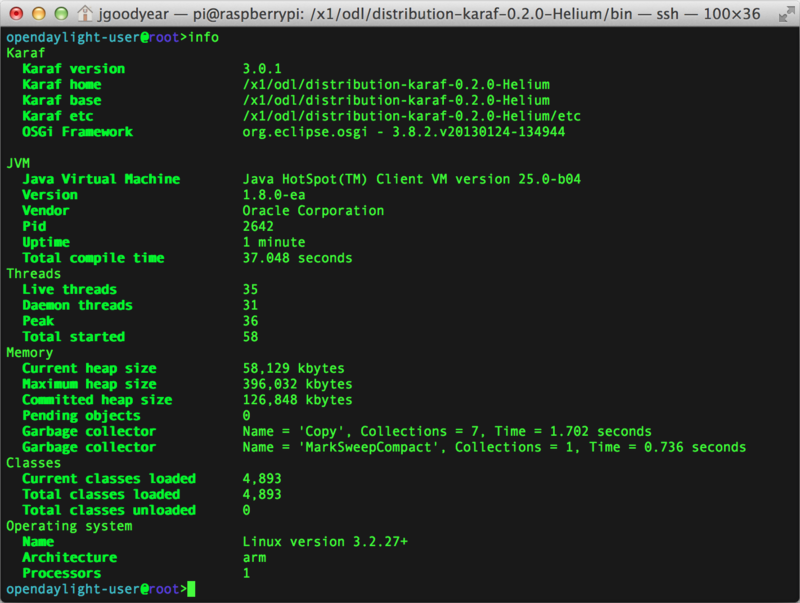 JVM vital statics in a Karaf console - awesome! Periodically updated top threads by CPU usage. The ktop command allows users to specify how many threads they'd like displayed, and the information update interval. Use the --help option to read the command's usage information. Sounds cool, I'd like to try it out on my Karaf system! The k23x branch is maintained for Karaf 2.3.x format, k30x for Karaf 3.0.x format, and master will track Karaf 4 style commands. How do I build and install ktop into my container? How do I use ktop once installed? The code is under the GNU license at the moment, as per a project requirement -- we will have it under the ASL in the future. In the mean time if you're looking for a way to monitor your Karaf container from your console window, give Aetos ktop a try! OpenDaylight Helium on Raspberry Pi first performance benchmark results! 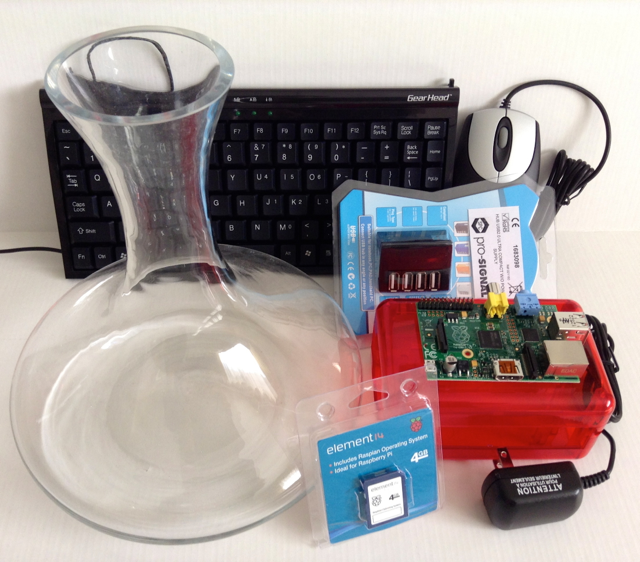 Last week I posted about getting OpenDaylight Helium release to run on my Raspberry Pi. This week I've spent some time setting up the platform for some simple benchmarks. To benchmark the system three things had to come together: Helium running on Karaf, the wcbench utility running on a separate host, and the overall platform being stable enough to execute enough tests to produce statistically relevant data sets. In my previous post, I outlined how I was able to tweak Helium into running on RPi. To these alterations I added one more tuning parameter: Xss200k. This reduces the startup size of Java threads, making it easier on the JVM and RPi to provide resources. See my github repo for sample Helium scripts. Setting up the wcbench tool required standing up a host machine, in my case a Fedora Core 20 VM, and configuring its scripts to point to the RPi. Given the RPi's limit resources I tuned the number of switches, mac addresses, and time to run each test down. See my github repo for sample wcbench configuration. Using the test tool would also require installing a few packages onto the Helium deployment. Through trial and error I discovered it was easiest on the RPi if I installed as many smaller features first before attempting top level targets. See 'Setting up Helium for testing' on my github page main read me file. The trouble was that even though OpenDaylight Helium could boot up and install packages, it couldn't handle the heavy traffic. The system would freeze up, becoming unresponsive. Memory was completely consumed. This is where the above '**' comes into play. Up to now I've been using a relatively default vanilla installation of Rasbian on the RPi. To obtain useful benchmark results I would have to provide OpenDaylight with more resources to do its thing. Hence I proceeded to the net, and found performance tweaks for RPi. 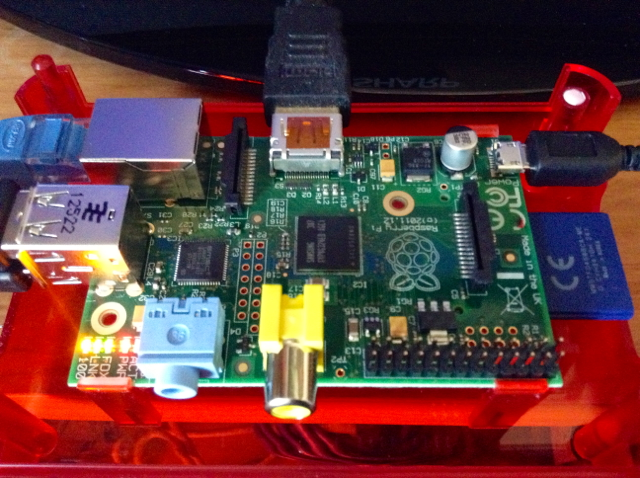 See my github repo for a full list of the configuration changes I made to my RPi. An extra 40MB free ram, and 255MB of swap space! With my platform tweaks applied, the system booted up much quicker. I executed the loop_wcbench script with the -l and -t5 option for 25 data sets. See results.csv for full results. Unfortunately, the scripts were not able to dial into the instance to grab detailed system information, so I made the adjacent screen capture of the top command during the test. After running the benchmark tool with 10 simulated switches and 10 MAC addresses, I attempted increasing the load to 100 switches and 100 MAC addresses - the system promptly froze. There are probably more system tweaks that could be applied to the RPi to free up more memory, and additional JVM tuning to make operating Helium more performant. I've published all of my tunings, and configurations to a git repo so that others may use my experiments as a starting point. If you do decide to dive in and try out Helium on RPi, please let us all know about your results in the comments below. 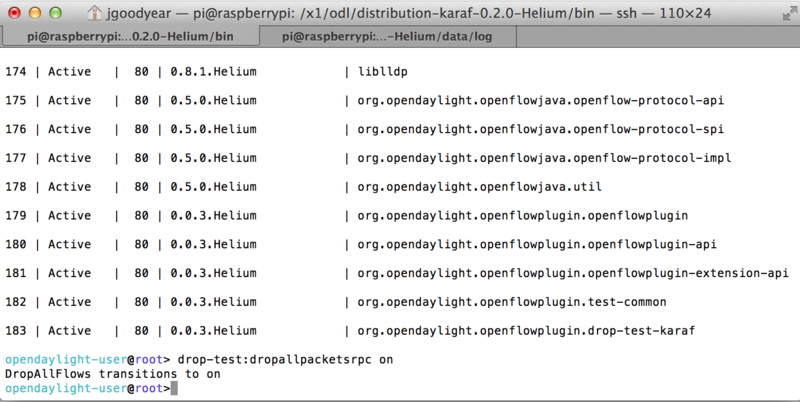 The question we've all been asking has finally been answered - yes, OpenDaylight Helium Release can run on Raspberry Pi! Out of the box I had to make three small modifications to the scripts found in the OpenDaylight distributions' bin folder. The set environment script (setenv) had JVM parameters for PermGen and Max Memory set higher than the RPi could support. I set these values to 340MB for PermGen, and 400MB for Max Memory. These are not optimal settings, but will work well enough to get things going. The karaf script used to start the container also required a memory setting to be adjusted from 512m down to 340m (just grep the script code for 512 and replace). 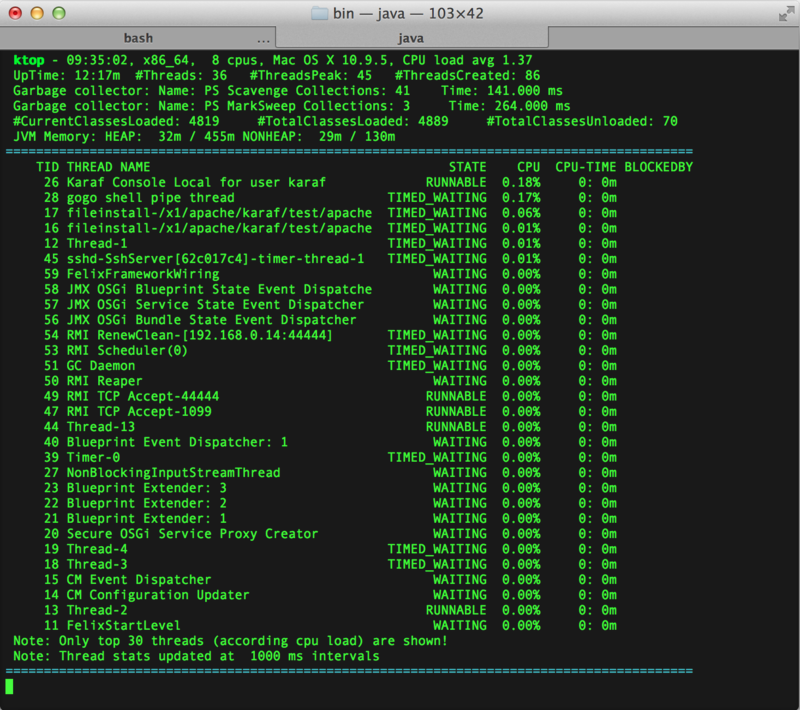 Finally, in the karaf script the JVM "server" flag was not recognized by the Java installation on my RPi. Editing this out of the script allowed Karaf to start up happily. This turned out to be a minor inconvenience. A simple invocation of install -s mvn:org.apache.sshd/apache-sshd/0.12.0, and an edit to ODL_HOME/etc/config.properties to include a JDK 1.8 entry for osgi.ee and the ODL Toaster was installable, and running! Helium on RPi can make toast! I used jconsole to manipulate the makeToast and clearToastsMade operations exposed via JMX on the controller to verify their correct operation - using log:display I could view each operation's logging events. This is an very impressive improvement over the previous OpenDaylight release which, despite my best efforts, I could not get to boot on RPi to a stable console out of the box. It's amazing how well OpenDaylight has taken to scaling from small PCs like the RPi to serious big iron servers we find in datacenters. Its important to note that for my ODL on RPi test I've only installed the base ODL Helium distribution, SSHD 0.12.0, and performed a feature install on odl-toaster target. The Karaf based features mechanism took care of downloading, installing, and configuring all the plumbing required to get the demo running.